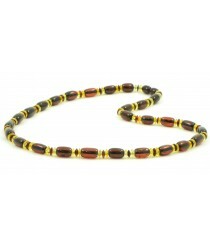 Mens Amber Necklaces There are 19 products. 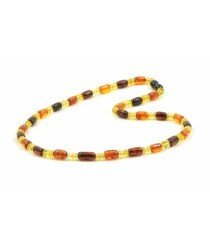 In this category you can find Amber Necklaces that are specifically made for Men. 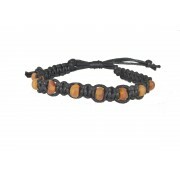 They are comfortable and lightweight to wear and can match well with almost any outfit. 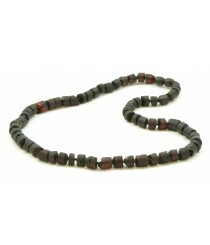 To increase durability of these necklaces, beads in them are knotted between each other. 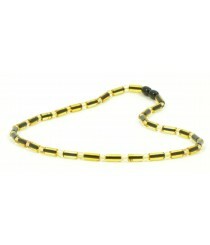 Our jewelry can not only look good on any men, but also it can provide them with some potential health benefits. 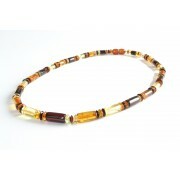 Wearing jewelry made of Amber beads can be beneficial for adults immune system, provide with some pain relief and enhance mood. 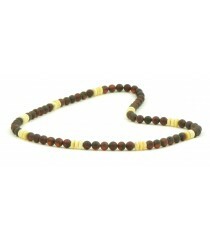 All of our men necklaces only contain top grade Amber beads that come from Baltic Sea. 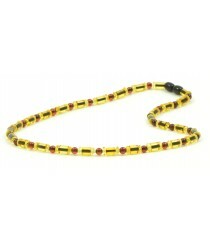 On average each necklace is 45 centimeters long (17 inches) so they can fit most men just perfectly. 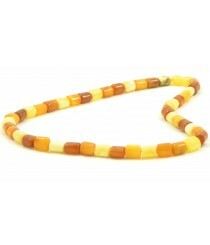 Colors of our necklaces vary from dark green to lighter shades of Amber like milky so you can definitely find a design that you love. 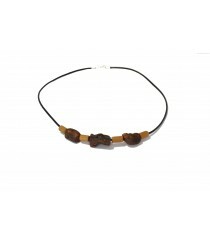 Product ID: M2; Short Description: Cognac Amber Men Necklace; Color: Cognac; Weight: ~17 or 19 g; Length: ~45 cm (17.7 inches). 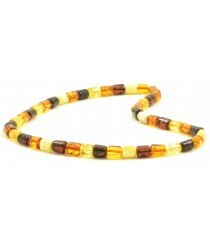 Product ID: M4; Short Description: Milky Butter Amber Necklace for Men; Colour: Milky Butter; Amber Beads: Polished; Weight: ~18 g; Length: ~45 cm (17.7 inches). 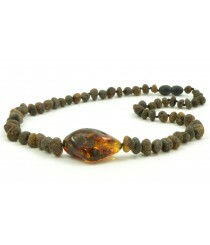 Product ID: M7; Short Description: Raw Green Amber Necklace for Men; Color: Green; Style: Baroque; Amber: Unpolished (Raw); Weight: ~18 g; Length: ~45 cm (17.7 inches). 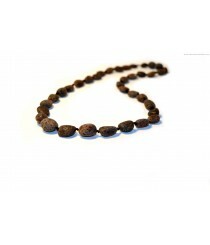 Product ID: M8; Short Description: Raw Men Necklace. Black or brown leather. Wood Cylinder. 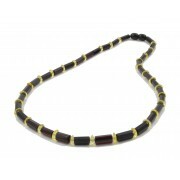 Weight: ~8 g; Length: ~45 cm (17.7 inches). 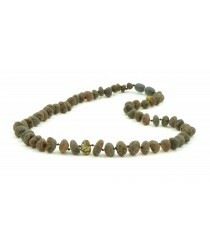 Product ID: M9; Short Description: Raw Green Amber Men Necklace; Style: Olive (bean); Amber: Raw Beads; Color: Green: Weight: ~10 g; Length: ~45 cm. 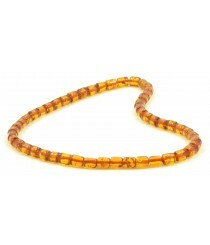 Product ID: N233; Short Description: Adult Faceted Amber Necklace for Men; Amber: Faceted; Length: ~49 cm (19 inches); Weight: ~10 g; Color: Cherry and Lemon. 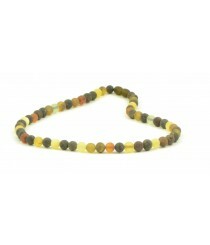 Short Description: Raw Green Amber Necklace with Round and Cilinder Beads; Product ID: M14; Color: Green; Clasp: Plastic Screw Clasp; Average Necklace Weight: ~17 grams; Length: ~45cm (17,71 inches); Amber: Raw, Round, Cilinder. 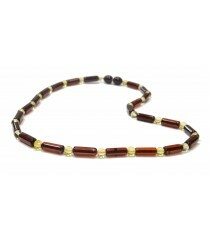 Short Description: Raw Round Cherry and Milky Tablets Amber Necklace; Product ID: M15; Amber: Raw, Round and Tablet; Clasp: Plastic Screw Clasp; Average Necklace Weight: ~13-14 grams; Length: ~45cm (17,71 inches); Color: Cherry, Milky. 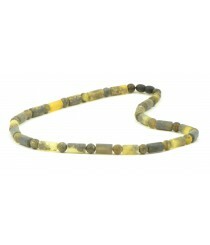 Product ID: M16; Short Description: Raw Multi Amber Necklace for Men. Weight: ~14 g; Length: ~45 cm (17.7 inches).